LAKE PLACID, NY—Telling reporters that they would be open to hundreds of other cities and towns across the country, members of the 1980 “Miracle On Ice” U.S. Olympic hockey team openly wondered Wednesday whether their next reunion could be held anywhere other than Lake Placid. 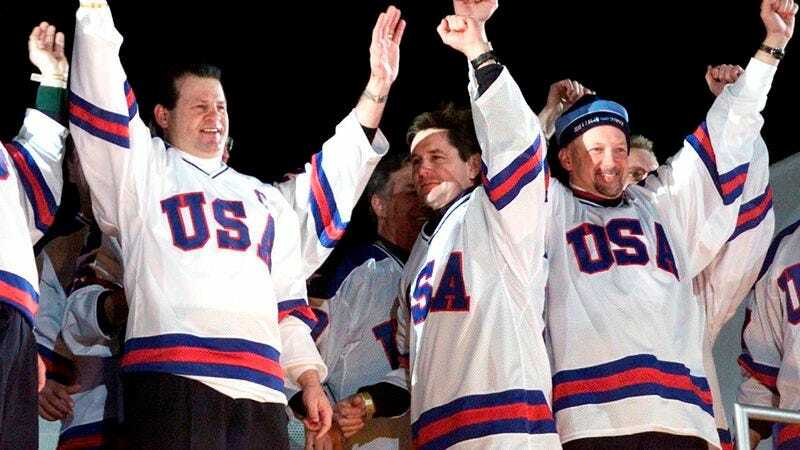 “Just out of curiosity, would it be possible for us to celebrate our historic achievement in a city that, I don’t know, has more than a few thousand people and isn’t in the middle of nowhere?” said former captain Mike Eruzione, adding that while there are certainly many great memories associated with the town, he and his teammates have no desire to spend another weekend of their lives wandering around weather-beaten 35-year-old Olympic facilities in the dead of winter. “I hate to say this, but c’mon, this place is a shithole. Maybe we could put on our old Team USA jerseys and get together somewhere warm like Miami or Los Angeles. Hell, even going two hours south to Albany would be a big improvement on this dump.” Eruzione added that the team would happily spend the event’s 40th anniversary in Russia if it meant they would never have to return to Lake Placid again.